At the Commemoration of the 70th Anniversary of the Commonwealth, a newly established Legal Institution Known as Legal Link has collaborated firmly with the British Council and the Commonwealth Alumni Chapter in Sierra Leone with a public lecture on Human Rights and the values of the Commonwealth by the Human Rights Lawyer, Rashid Dumbuya who is also the founder & Chief Executive Officer (CEO) of Legal Link and a Commonwealth scholar from 2014-2015. 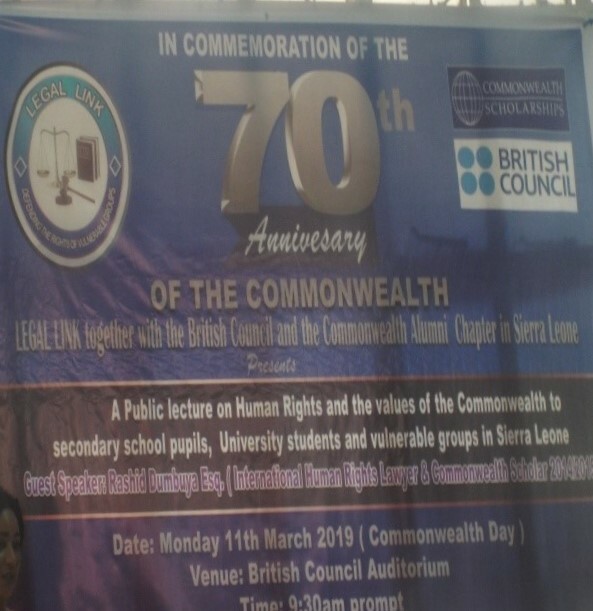 The public lecture was delivered to mark the Commemoration of the 70th Anniversary of the Commonwealth day which was held at the British Council Auditorium at Tower Hill in Freetown on the 11th March, 2019. Introducing the guest speaker, a Legal Student, Isatu Jallow told participants to tights-up their seat belts while she introduced the Guest Speaker who she described as an International Human Rights Legal Expert and also a Legal Member of the Bar Association of the Judiciary of Sierra Leone, Rashid Dumbuya Esq. 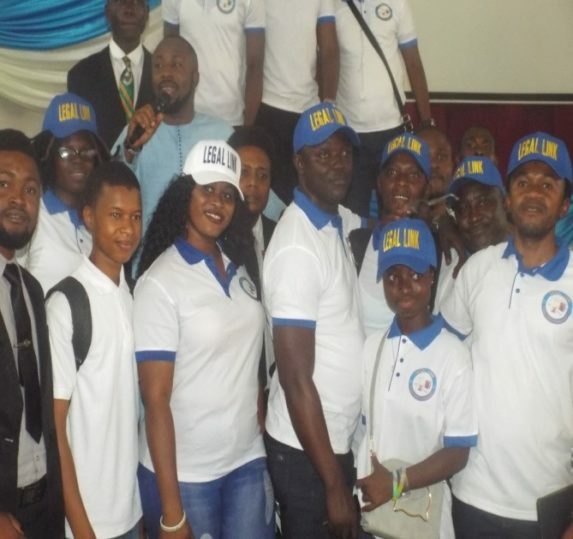 Madam Jallow appealed to young people to emulate Lawyer Dumbuya in the fight to provide Legal Link especially for Women, Children and the less privilege in Sierra Leone. In his PowerPoint Presentation, the Guest Speaker, Lawyer Rashid Dumbuya said his public lecture is to mark the commemoration the 70th Anniversary of the Commonwealth which started since 1949 nothing that his lecture is based on Human Rights and the values of the Commonwealth in the presence of Secondary School Pupils, University Students and Vulnerable Groups in Sierra Leone. He said Legal Link together with the British Council Alumni Chapter in Sierra Leone decided to present the a public lecture on Human Rights and the values of the commonwealth which he said is made up of 53 members states including both advanced and developing countries. Lawyer Dumbuya noted that, Sierra Leone is found in the West Coast of Africa with a population of over seven million people of which over 500,000 perished during a brutal rebel war in the country and thousands of women were raped. “Human Rights are inherited, every human being should enjoy Human Rights whether rich or poor, Human Rights apply to all human being no matter the race, color, religion or nationality, Human Rights are invincible in nature, they are inter-related and Inter-Dependent ” Lawyer Dumbuya reiterated. He went further to narrate that under the Human Right Law, nobody can escape from the Universal Declaration on Human Rights (UDHR) which he said was endorsed in 1976 and he also deliberated on the International Convention on Chartered and People’s Rights, (ICCPR). “If any of these states neglect the Rights of its citizens especially on their rights to health, education, and the rights to food, that state must be penalized for exploiting the International Bills of Rights,” Commonwealth Scholar Divulged. The Human Rights Lawyer reiterated further on how Human Rights had created a moral vision adding that Human Rights are necessary. He noted that Commonwealth was found in April 26th, 1949, when leaders of Australia, Canada, India, New-Zealand, Parkinstan, South Africa among others with a total of over 2.4 billion people across the 53 members states. He spoke on the successes and challenges of commonwealth with regards to holding states accountable for misappropriation of funds and to also identify caps within the commonwealth. He said lack of effective reporting framework and absence of review process is affecting the work of these countries and that commonwealth Summit of Heads of States are hold every two years. In his quick statement, the Country Director of British Council Auditorium, Tower Hill in Freetown, Tony O-Really commended Legal Link for partnering and vows to report what has transpired during this commonwealth day.